Whether you're shopping for a cocktail ring, an eternity band, or another lovely style, you can have the beauty and sparkle of a brown diamond ring without a high price. Simulated diamonds add warmth and glitter to many affordable ring options. You'll find simulated brown diamonds in a variety of styles and shapes. For the best selection, shopping online makes the most sense; however, you may encounter some options in local jewelry stores. No matter where you choose to shop, there's a ring out there that will fit your taste and budget. Many of the artificial brown diamond rings out there are considered "cocktail style." Typically, they are large and statement-making, the kind of rings that will get you noticed. 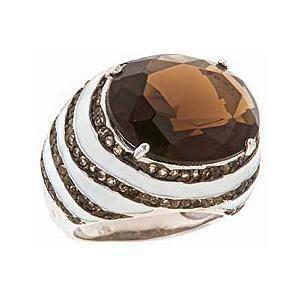 Brown Cubic Zirconia Ring - This chunky sterling silver ring from Amazon features three rows of baguette-shaped cubic zirconia surrounded by brown-colored cubic zirconia. This ring retails for about $45. East West Set Diamond Essence Ring - This sweet ring from Diamond Essence features a 2.5-carat simulated chocolate diamond. The halo and band are encrusted with .5 carats of round stones set in yellow gold. This ring is priced at about $500. Whether you choose a simulated brown diamond style for your wedding band or you just want a pretty ring to wear with a great outfit, you can find a band-style ring with simulated brown diamonds. These rings can be simple or ornate, and often feature pave settings. For example, the Chocolate CZ Wedding Band is an understated yet elegant look. This band is channel set with small brown cubic zirconia and white cubic zirconia. It's made of rose gold over sterling silver and retails for about $15. When you purchase a simulated diamond, you don't have to worry about clarity and cut as you would with a genuine diamond. However, quality is still important. Keep these tips in mind to find a high-quality ring you'll love. Most simulated diamond rings are set in sterling silver. This durable and lovely metal is a great choice for this type of ring, and it will help ensure your artificial diamond will remain securely in its setting. Stay away from base metal or lower quality rings, since you may risk losing your pretty brown stone. 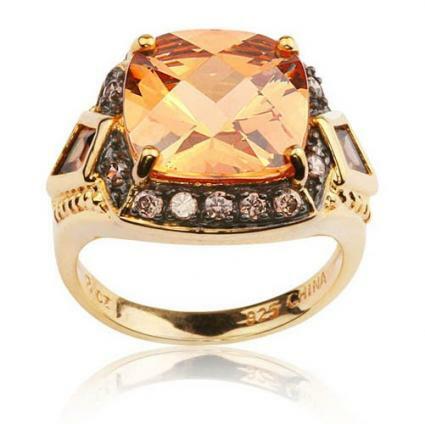 Cubic zirconia is one of the most popular kinds of simulated diamond, and it comes in brown. Remember to keep this in mind as you're looking at your shopping options. This beautiful simulated gem has all the sparkle of a diamond without the high price. Brown czs are likely much more attractive and long-lasting than other costume jewelry options. Artificial brown diamond rings come in a wide range of styles. Whether you choose a striking cocktail ring or a classic pave band, simulated chocolate diamonds add warmth and beauty to any ring.